ONE of the original cast members from a Cliff Richard film has reprised his role 46 years later for a Highgate theatre. 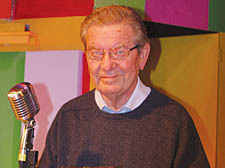 BBC newsreader Richard Baker, who was the face of the Six O’clock bulletin for three decades, appeared in the 1961 film The Young Ones – as himself. And when the Gatehouse Theatre in Highgate decided to run it as their Christmas musical, he was asked to repeat his performance. And treading the boards was straightforward for Mr Baker – he spent much of his time at Cambridge University in the drama society and worked as an actor before landing a job at the Beeb. His studies were interrupted by the Second World War, where the lad from Kensal Rise served in the Royal Navy during the war on HMS Peacock, a frigate that accompanied convoys across the Atlantic. After finishing his degree – he studied medieval history – he performed across the country in Rep and even landed a Shakespearean role in Berlin in 1948. In the early years of TV news, he was one of just six newsreaders and became a household name. Naturally, he appeared as a newsreader and filmed the scenes over two days at Elstree. When the Gatehouse’s John Plews watched the original and spotted Richard, he hit on the idea of inviting him to perform. The film has other Camden links: the music was composed by former Hampstead resident Ronnie Cass and his co-writer Pete Myers whose daughter Saffron approached The Gatehouse to put on the show for Christmas. Richard worked for the BBC from 1954 until 1982 and told the world of some of the biggest news stories of the period, covering such events as the death of Churchill, the assassination of John Kennedy, the Aberfan disaster when a school in Wales was destroyed by a slag heap, and the start of the Falklands conflict. But it was not always grim: he recalls the excitement of covering the 1966 World Cup and the Moon landings, and the time when he and other newsroom colleagues were persuaded to do the sailors’ song from South Pacific for Morecambe and Wise. Richard’s name and voice will be instantly recognisable to anyone over a certain age, and he is still stopped in the street, although he is self-deprecating about his fame. Return of the Johnny foreigners who really know their onions! I SAW a sight on Thursday that reminded me of days gone by as I meandered through Hampstead village looking for an Christmas present: a man in a beret with a push-bike laden down with onions and garlic. He was a typical “Onion Johnny”, the name given to French traders who came to Britain from the town of Roscoff to sell their produce. Keen, perhaps, to make rich sage and onion stuffing for Christmas Day, customers were queueing for their ingredients. It turned out that the trader, Emmanuel Lemoach, was just one of two Onion Johnnys left in London. “It is a longstanding tradition in my home town,” he explained when I asked him how he got to become involved in such an unlikely livelihood. He said that Roscoff is a small town of just 3,500 people in Brittany and people made a living growing and selling onions and garlic. Just after the war, there were as many as 1,500 Onion Johnnys in England. He recalled learning about his town’s onion heritage at school and each year the town holds a summer onion festival. There is even an onion museum dedicated to the vegetable in Roscoff, which is the only place in France where they grow a famous variety known as the “pink onion”. Roscoff farmers started growing onions in the 17th century after they discovered they lasted well, he said. By plaiting them they can stay fresh for up to six months. Though trade was still good in Hampstead, it wasn’t too lucrative. “After all they’re onions, not diamonds,” he laughed. THE Dublin Castle – Camden Town’s famous rock ’n’ roll playground – rarely sees Andrew Marshall, Tory deputy leader of the council. But, sure enough, there he was the other Sunday – enjoying a drink and listening to the music. Don’t think Andrew has suddenly discovered a new penchant for noisy guitars, though. He was there to see the Castle’s first ever classical concert – all in aid of the New Journal’s hamper appeal. He confessed disappointment at not being given the role of Santa Claus for the appeal – that was snapped up by his Tory colleague Don Williams who handed out hampers for the New Journal. “I’m happy to do it next year,” he said.